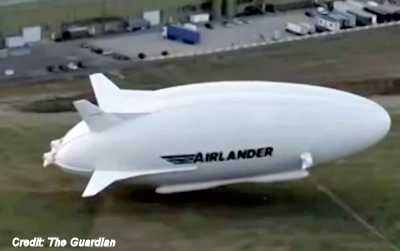 flight of the Airlander 10, a helium-filled craft aiming to kickstart a new age of the airship. It has been a while coming – the first flight had been delayed several times and Wednesday’s takeoff was held up for hours – but once in the air, showing off its curves as it banks and soars for its audience, the Airlander is quite a spectacle. At 92m long and 43.5m wide, this is the world’s largest aircraft, dwarfing heavyweights such as the Airbus A380 “superjumbo”. It is a bit cheaper, too, with a catalogue price of £25m, compared with $375m (£287m) for an A380.